America's favorite grilling board! Manufactured in Vermont under the shadow of Owl's Head Mountain, these famous boards are as perfect for assembling kabobs, slicing seafood, and paring vegetables as they are for carving and serving barbeque. This hardwood BBQ board is made in the USA from Vermont hard rock sugar maple. A generous juice groove runs straight around the perimeter define the handles so they can be found without fail. 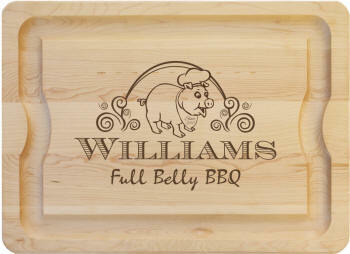 We expertly laser engrave this durable and lasting Vermont hardwood BBQ cutting board with a plump pig wearing a chefs hat and a bib that has the family's established date. The Name is largely engraved and the words 'Full Belly BBQ' is placed underneath. A suitable for any gift giving occasions. Board size: 20 in. x 14 in. x 1 in.